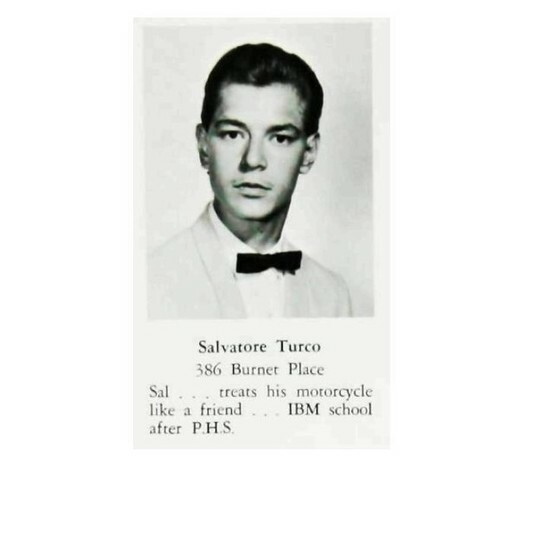 Sal Turco, Paramus High School Class of '68, died April 26 in Lakewood Township, NJ. Salvatore was born in Paterson, NJ to Salvatore and Eleanor Turco on November 28, 1948. Sal is survived by his three children, Eric Turco, Ashley Witek and Nicholas Turco and his two brothers, Charles J. and John Turco and his two sisters, Lorraine Fridella and Ruthann Page and his granddaughter Minerva Turco. I am so sad to hear about Sal. We met at Westbrook and graduated together. He will be missed. With much sympathy. We are so sorry to hear about Sal. I feel like Steve was a little part of his family when we were kids. I got to go with him to your parent's soda place and loved it. You are all such a great family and Sal will be missed. Please give our regards & sympathy to the whole family. So sorry to hear of the passing of Sal Turco, thoughts and prayers to all his family.